The calendar showcases designs with bold colors, overall metallic and pearls, military camouflage and classic overall white styles with sleek striping. The Sherwin-Williams aerospace topcoats featured in the designs vary from single-stage (monocoat) systems such as Jet Glo®, Acry Glo® and Jet Glo Express™ and basecoat-clearcoat systems such as SKYscapes® and SKYscapes® General Aviation. The 2019 Aerospace Coatings Calendar is set to release in mid-December 2018. To receive the 2019 Aerospace Coatings Calendar, contact your local Sherwin-Williams Aerospace representative or distributor. 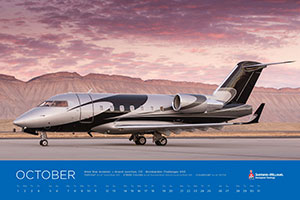 For more information about the Sherwin-Williams Aerospace Coatings Calendar, visit https://www.swaerospace.com/home. For other Sherwin-Williams inquiries, call 1-888-888-5593.